Graham Nash had begun playing the guitar during his early years at Salford Grammar School where he would practice his chords each lunchtime by the bike sheds with two friends, one of whom- John Eaton- had actually taught him the instrument. Graham took a job in a local sub-post office after leaving school but the music bug had bitten too deeply for that to last for long. Initially Nash began singing together with Clarke as a duet, but they expanded to a fourpiece in 1962 taking the name Hollies in deference to their late role model, Buddy Holly. Their first single charted, but their build up was slow compared with many other groups. However, their slow start was followed by a steady and sure flow of highly successful chart hits. They wrote many of the songs themselves including 'Stop Stop Stop', 'On A Carousel' and 'Carrie Anne', all of which were tailor made for the smooth harmonies of Clarke and Nash. 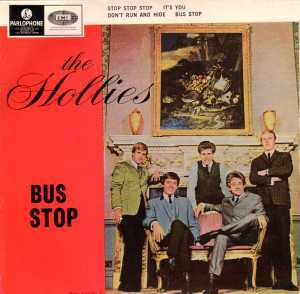 The EP shown on the left was released at the end of 1966, contains two of the group's most memorable hits ("Stop, Stop, Stop" and "Bus Stop") and may seem fairly typical. However, this particular EP was released in Australia and is therefore fairly unusual for a UK collector to find on his shelves. By 1967 Nash decided that he needed to move on because he felt the group's range of material was too restrictive. He went on to join Crosby and Stills and was replaced by Terry Sylvester. The group's style changed slightly and they ceased writing their own material, but the hits continued. into the 1970s.and even achieved a couple of minor placings during the early 1980s. The Hollies have proved to be one of the most enduring of all the 1960s groups and are still going strong today. At the beginning of 2001 Allan Clarke announced his retirement and his place was filled by former Move vocalist, Carl Wayne. Sadly, Carl passed away on August 31st 2004.